What is Bridalicious® Boot Camp? Bridalicious® Boot Camp is a group fitness training program that was created in 2005 specifically for the bride-to-be. Thousands of brides have used our program with amazing success. All ladies are welcome. Friends, co-workers, bridesmaids, mothers-of-the-bride. Any woman who has a can-do attitude to get into the best shape of her life! Where is boot camp located? We are super excited to have recently moved to a beautiful new indoor facility -- Extreme Studio Performance. On nice weather days, we also use the outdoor areas of our location. 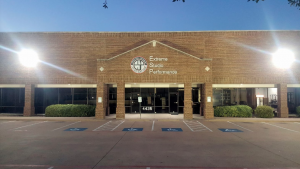 Extreme Studio Performance (ESP) is less than a mile west of The Galleria. There are clean showers and a large dressing room available. *Evening sessions start Tues, March 13, 2018. Morning sessions available immediately. All boot camp members may attend unlimited workouts at any time above. Most Tue/Thur evening boot campers also attend each Saturday at 8:00AM. All boot camp sessions are 45 minutes. How far in advance of the wedding should I start to get the best results? Most brides join about 7-12 months before the wedding, but it can depend on your fitness goals, but some have started only 60-90 days in advance. The longer you give yourself, the better chance you have for stunning, breathtaking, transformative results. It is strongly recommended that you start as soon as possible. What is a typical session like? First of all, it’s FUN! The workouts are always changing to give you maximum results in only 45 minutes. We combine resistance training, running, core, body weight, and fun sports training type drills. It’s always an adventure, and you’ll love meeting new people while blasting fat and burning calories! What should I expect to achieve? In a very short period of time you should expect to lose 2, 3, or 4 dress sizes, reduce your overall body fat, shape up, slim down and feel more energy than you have in years. How can I get hold of you if I have a question? We answer questions promptly by email via our CONTACT form. Your questions are important to us, and we WILL get back to you. I am out of shape, can I still do the program? The answer is YES, YES, and YES. This might be one of most frequently asked questions of them all. Throughout our history of boot camp starting in 2005, about 70-80% of those starting were "out of shape." The great thing is that whether you are a workout warrior or totally out of shape, you will love the results. What if I can't make it to all of the sessions? No worries! Most participants miss sessions from time to time. If you can make it at least 2-3 times per week you can get great results. There are also home workouts available to you. Can non-brides attend as well? Yes! Bridalicious® Boot Camp is a workout group for women only and bridesmaids, co-workers, mother-of-the-bride, relatives, neighbors are all warmly welcome. Your health questionnaire and water is all you need for our indoor workouts. If you attend the evening/outdoor bootcamp you need to bring: (1) your health questionnaire (2) yoga mat (3) 5, 8, or 10 lb hand weights (4) water. Are non-brides welcome to attend too? Yes, absolutely. We have always had many non-brides in our group. Ladies of all shapes, sizes and fitness levels are welcome. Friends, bridesmaids, mother-of-the-bride, co-workers. All you need is a can-do attitude. What is the difference between boot camp and a class at a gym? Bridalicious Boot Camp has a much different feeling and atmosphere than a gym or health club. It is a fun and motivating environment. There is a very friendly vibe, and you get to know your fellow boot campers, with many becoming long-term friends. Unlike most gyms, we also have our “no sweat” money-back guarantee. If you don’t get the results you were anticipating, you can ask for, and receive your money back with no questions asked. Are there locker room/showers available? Yes, you are welcome to use the showers and dressing room facilities at Extreme Studio Performance.